Do you feel like you could be getting much more work done during your day? Do you feel like the day is just too short to get all of your tasks accomplished?Staying focused at work can sometimes seem easier than it is. 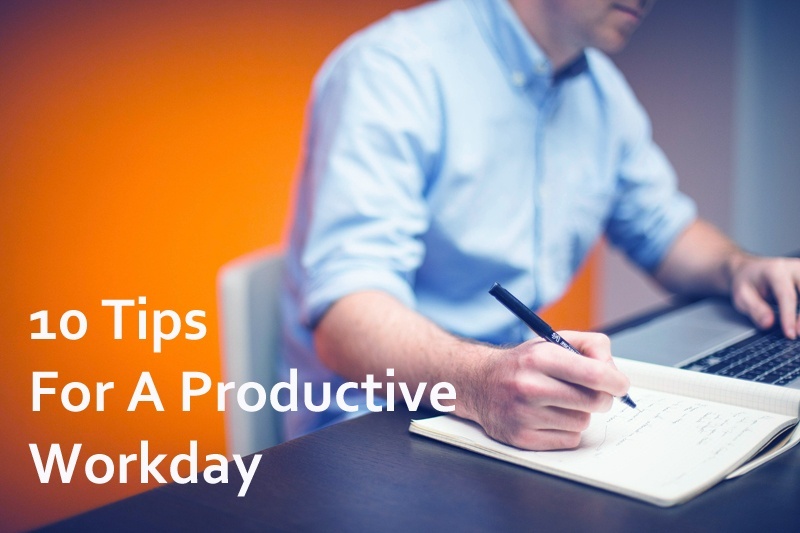 Here are 10 tips to help you stay productive throughout your day. 1. Set a work routine. Time management is a key part in being productive at work, and completing your work on time. With good time management skills comes success in the workplace. Start your workday with a quick and easy project on your to-do list. Accomplishing a small project in the beginning of the day will make you feel good and feed your productivity for the rest of the day. When you stick to a routine, your body and mind adjust to it. 2. Write down your to-do list. Make your goals realistic and specific. Set a deadline for each one. Do each task one by one and check them off your list as you go. It is sure to be a rewarding feeling when all of your tasks are checked off and completed! 3. Pace yourself and balance your workload. Before the day starts, take some time to really plan out your work schedule. Consider how much time it took you to do it last time and determine how you can break the project into smaller parts. 4. Designate times to handle e-mail. You’re never going to get anything done if you are constantly checking e-mails mid-project. Instead, give yourself times during the day to check your email to avoid distraction. 5. Stay organized. Having a messy desk can result in important tasks getting lost in the chaos. Keeping your desk clean and clutter-free will allow you to focus your attention on your work rather than the mess around you. 6. Take breaks throughout the day. Breaks allow you to step away from your work for a bit and give you a chance to clear your head. Walk around the office, talk to co-workers, or grab a quick snack. You are sure to come back to your work with renewed energy and a fresh mind. 7. Weed out distractions. There is no denying we are all guilty of checking our social media sites, e-mail, and other websites like BuzzFeed and The Onion throughout the day. If you find that you are really falling behind on your work, and feel like you don’t have enough time in the day, think about weaning yourself off these sites completely. 8. Prioritize. A couple times during the day, take a step back and examine if your efforts are focused on the right projects. Ask yourself if what you’re working on is really the most important thing for the time being. The more important your work is, the more valuable you are as an employee. 9. Spend a few minutes preparing for the next day. After you’ve completed your work for the day, organize your desk, and prepare a to-do list for the next morning. Before you go to sleep, prepare yourself for the morning. Set out your clothes, pack your lunch, and get together anything else you might need. The less you have to do in the morning, the less chaotic it will be and the smoother your day will be. 10. Get plenty of sleep. Everyone could use an extra hour or two of sleep each night. If you are half asleep at work, odds are that your quality of work will not be up to your highest standard. A good eight hours of sleep will set you up to be productive the next day. Which of these works the best for you? Tell us some of your own tips you do throughout your workday!